It would be tempting to describe the southeast corner of Cameroon as a land that time forgot, but it would also be a disservice to the people still living there. You see, in order to forget something, you must first come to know it and there is very little about that 75-100 sq. mile chunk of life that the Western World ever bothered to try and comprehend. 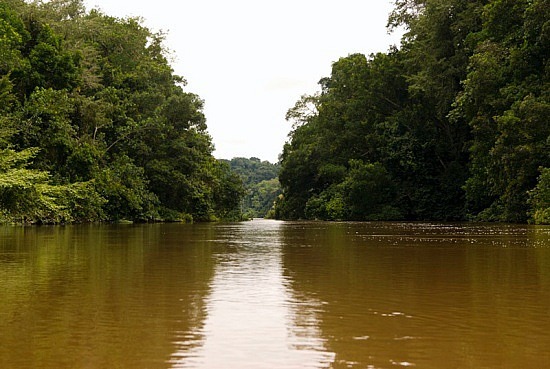 Bracketed by the Boumba River to the west and the mighty Sangha to the east, this patch of tropical forest is sealed into an inland peninsula to the south by the Ngoko River. For tens of thousands of years, life followed a very predictable script in these lands. Whether they were Bantu or Baka peoples or any tribe that may have inhabited the land before, little changed beyond the ken of their experience. It doesn’t particularly matter if you were a hunter-gatherer or a farmer and herder. There were a narrow set of outcomes in your life and what you did would likely be a mirror image of those who came before you. When you were hunting, you may have killed a chimpanzee and, having done so, set about disemboweling the animal, carving up it’s flesh and meting choice organs for that night’s meal. During the hunt or while dressing the chimp, you may have cut yourself and some of the chimpanzee blood could have mixed directly with your blood. And, being in a very specific corner of Africa, these chimpanzees you killed and became unwilling blood brothers with could have been carrying a Simian Immunodeficiency Virus (SIV—sound familiar?). In 99.9% of instances, that’s where this microbial story would end as zoonosis—the process of a virus being transferred from one species to another—is rare. While a surprisingly large percentage of Central Africans—2.3% in a recent study—have shown seroreactivity to antigens that suggests past or current SIV infection, the possibility of mutation into HIV is a once-in-a-lifetime type occurance. Beyond that, there are hundreds of different strains of SIV, so even if a bit of monkey blood got in you, there’s a good chance that the strain wouldn’t be the type that would eventually become a global human pandemic. But, suppose you had the misfortune of a) living in Southeastern Cameroon, b) having direct blood-to-blood contact with a SIV+ chimpanzee that, c) was carrying the HIV-1 Group M mutation of the virus (what we currently think of when we think of HIV) and d) later mutated some sort of way into HIV while in your body. While, this isn’t good news for you personally, it didn’t exactly spell disaster for anyone outside of your circle of friends and family. Like all viruses, HIV requires a consistent string of new hosts with which to spread and it’s impossible even for a disease with as long an incubation period as HIV to stay alive within a small, self-contained community. This is of course just speculation, but it’s very likely that numerous people have become infected with the HIV-1 Group M virus, but had nowhere to spread it, so it just died out. Enter the Wicked Witch of The West. As researchers Beatrice Hahn, Paul Sharp and others have discovered, it was the influence of late 19th century Colonialism that likely set this terrible HIV machine in motion. Before Western European nations began slicing up the African continent into sections like a cored apple, the inhabitants of Southeast Cameroon had never had any contact with the outside world. But, as European colonial powers bored deeper into Africa in source of riches and resources, they two worlds eventually merged. Luckily for the HIV-virus, the Sangha & Ngoko Rivers played an extremely important role in the the burgeoning rubber and ivory trades at the turn of the century. Before the railroads were built through mass African forced labor, the only viable means of transporting these goods were by water. Soon, the still extant trading station of Moloundou was created out of nothing on the banks of the Ngoko and became a launching point for the spoils of colonial enterprise in Southeast Cameroon. From the Ngoko, steamships would meet up with the Sangha and then feed into the Congo River on it’s journey to the central trading hub of Leopoldville, or modern day Kinshasa. Tens of thousands of African men were used as porters to transport goods all across Africa and to perform manual labor. African women were raped by the colonists, while the new migratory habits of the colonial economy spread people and their diseases hundreds of miles away from home. There are a million and one different ways that the virus could have spread from that first host—patient zero—but we have a pretty good idea when this person contracted the virus. Based on two samples from Kinshasa in 1959 and 1960, evolutionary biologist Michael Worobey has determined that the samples descended from a single ancestor between 1884 and 1924, with the most likely date being 1908. From that date on, HIV began it’s slow migration to the bustling African metropolis of Leopoldville, where it finally had the teeming mass of humanity it required to bloom into an epidemic. Equally incredible is the fact that if this hypothesis is true, then it took over 60 years since that first infection for the first documented case of HIV/AIDS in the United States to be identified. HIV was a long time and a long way coming. For me, what this journey illustrates is the fact that it may take just as long if not longer to eradicate HIV as it did to spread it. For God knows how many thousands of years, HIV lay waiting as SIV in chimpanzees and gorillas all across Africa. It mutated and mutated and mutated again, trying to find the way to survive in the world. And even when it found the right combination of its maleficent components, it still had to wait thousands of years more until the perfect set of circumstances presented themselves so that it could flourish throughout the length and breadth of humanity. We’ve known what HIV/AIDS is for only 30 some odd years and we’ve already managed to turn it from an irreversibly fatal disease into a chronic one. While it has spread faster and with more vigor than we ever could have imagined, we have still found a way to stem the tide of its advance somewhat; to exert our unique ability to bend the will of nature and stifle disease. It surprised me greatly to hear that Polio was still an issue in Afghanistan, Nigeria and Pakistan. I had labored under the misapprehension that Polio had been completely eradicated, which I think is perfectly reasonable. Jonas Salk discovered the vaccine for Polio in 1952. That was 60 years ago! What does it say when we’ve had the cure for an illness for more than half a century and it still remains endemic in some parts of the globe? If an HIV vaccine was discovered tomorrow, there’s no guarantee we could get it to everyone who needed it. We can’t even get food and clean drinking water to everyone who needs it. Disease is an inescapable part of life. As I write this, there are thousands of viruses across the world with the potential to become endemic and by the time we solve the HIV crisis, one of them will be right there to take its place. But that isn’t what matters because even if we wiped all disease from the face of the earth, death doesn’t go away. What matters is how we act and how we fight. In the fighting is where we find ourselves and where we find others. * Special Thanks to Beatrice Hahn, Paul Sharp, The Washington Post, Radiolab and Google Maps for providing the information for this article. That was nice. Send more info on this subject. Has a cure be found yet HIV? How can I pass this message to my local people.